Here you’ve got an exclusive access to the lowest rates for car rental Beziers! Click on our search form to get your best car rental Beziers offer! Get the hassle out of your trip – reserve a car on RentalCars24h.com at the cheapest price and start packing a suitcase! Several clicks and your car is waiting for you at one of our 30,000 car rental locations worldwide including car rental Beziers. Choose the most suitable Beziers car rental location, get acquainted with Must Know and look through the Places to Visit with car rental Beziers! 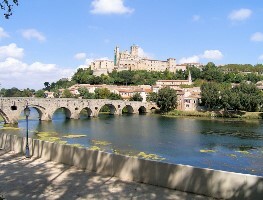 Beziers is located to the south-west of Montpellier in 60 km. Beziers is one of the oldest cities in France founded probably in the VII century BC. The city has many historical monuments testifying to its rich historical past: the ancient amphitheater, the cathedral of Saint Nazaire (first mentioned in VIII century), the Church of Saint Madeleine (XI century), the Canal du Midi (XVII century). The most famous monument in Beziers is the Cathedral of St. Nazaire of XIII century; it stands on a hill and is visible from afar, saying majestically on the status of the city and its past. Drivers who are used to driving on asphalt tracks now should be extremely careful. Many trails here are made of stone blocks which after rain become very slippery. In urban areas drivers should pay particular attention to the local cyclists. Sometimes two-wheeler riders there can enjoy leisurely drive along the busy center of the highway and easy talk on the phone. Honk and complain in such situation is not accepted here. 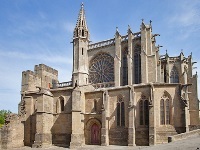 Cathedral of Saint Nazaire is the main attraction of Beziers. This grand monument of Romanesque architecture dating 13th century is situated on a hill with a beautiful view of the vineyards and the foot of the «Massif Central» mountain chain. Outside the building looks very strict with a lot of vertical lines. There’s no clear symmetry so the ensemble does not look monumental but seems to be very light. Don’t miss your chance to see this architectural beauty, jump into your car rental vehicle right now! Museum of Fine Arts is one of the best museums in the city which includes works by Rubens, Delacroix, and several local artists. 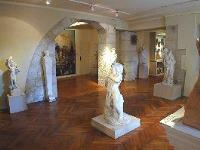 Museum is situated in the old mansion of Hotel Fabregat and has a branch in Hotel Fayet. Drive your car rental vehicle to see unique pieces of art! The annual festival «Feria» (created on the principle of Spanish bullfighting) is held in mid-August, about 15 August and lasts for 4 days. During these days the brave young men test their bravery, the streets of the city are full of festival processions, and the extraordinary atmosphere of the festival is not leaving it for all the festivities. Take advantage of your car rental vehicle and drive around the town to see everything it can show you during Feria! Roquebrun is a picturesque village in the valley of the Orb just in 20 km north of Beziers, located in a wonderful place between the steep cliff and the river. Due to the special microclimate it is producing excellent wines that can be purchased in local stores. It is also a great place for swimming in the river. Get into your car rental vehicle and drive in the destination of this cozy beautiful pace! RentalCars24h.com offers you reliable car rental Béziers services that will help you to feel free and independent when moving around the town. Providing best online prices for car hire Béziers services, RentalCars24h.com allows you to save money each time when you rent a car in Béziers.